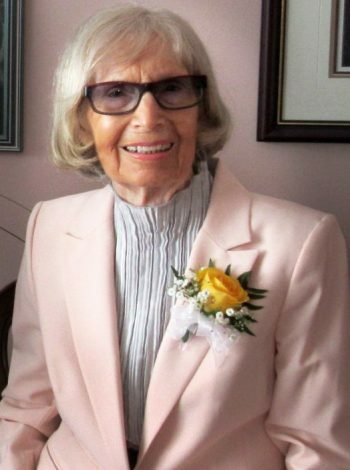 Passed peacefully away at home, Saturday, May 19th, Nan Edwards (nee Pike). Predeceased by siblings, Walter, John, George, Roy, Jean and Grace Gaudet. Leaving to mourn loving husband of 63 years, Dave; daughters: Elizabeth (Bob Barnes) and Jennifer Edwards (Roy Howell); grandchildren: Erin (Trent Squires), Tim Barnes (Marie LaFreniere), Shane and Matthew Lovelace; precious great grandchildren: Grayson and Layla Squires; brother, Frank Pike (Rhoda); brother in Law, Brian Edwards (Florence, Deceased); plus many nieces and nephews. Special thanks to Dr. Rebecca Rudofsky for her compassion and care. Also to care givers Rose Somers for her companionship and support and Mary Bradley who made Nan’s last days so comfortable. Cremation has taken place. Funeral service to be from St. Thomas’ Anglican Church, on Tuesday, May 29th, 2018 at 2:00 p.m. Donations to St. Thomas’ Church, 8 Military Rd., St. John’s, A1C 2C4 or to The Church Lads Brigade, P.O. Box 28126 St. John’s A1B 4J8 gratefully received. To send a message of condolence, please visit www.carnells.com. Sorry to hear of Nan’s passing. Thoughts and prayers for the family. Sorry to hear of your mom’s passing. My condolences to you and your family at this sad time. Tiz, Bob, and family. Our most sincere condolences on the loss of your Mom. Our thoughts and prayers are with you now. So sorry to hear of Nan’s passing . Our deepest condolences to you & all the family at this sad time. Jennifer: so sorry to hear of this lady’s passing. Our condolences to you and your family. So sorry to hear of the passing of Aunt Nan. We are thinking of you at this sad time. So very sorry for your loss. Sincere condolences to you and your family. Sorry to hear of your mom’s passing. My thoughts and prayers are with you and your family. Our love and deepest sympathy goes out to all the family at this sad time. Our thoughts are with you. Sorry for your loss. Sending hugs and prayers to you and your family at this sad time. Dave and family,so sorry to hear of Nan’s passing.Gerry and I have some wonderful memories of our times together bowling.Our thoughts and prayers are you at this difficult time.Gerry and Mary O’Brien. Herb & I have very many special memories of you both over the years. The many years you bowled together and the friendship you shared. Nan was always a loving lady to all. May god bless you & comfort you at this difficult time. Elizabeth and family, my sincerest sympathies on the passing of your Mother. May loving memories help you through this difficult time. So good to finally leave you a message! You know I am thinking of you constantly. Our deepest condolences to you and your family. We will see you soon.xoxo. Dave and family,so sorry to hear of Nan’s passing,we have wonderful memories of her and our bowling years,may she rest in peace. Sincerely Donna & Lance Sparkes. your mind over the last few mind since Nan passed. So sorry to hear that Nan has passed away, our thoughts and prayers are with you at this special time. So sorry to hear of your mom’s passing. Our thoughts and prayers are with you at this sad time. Dear Uncle Dave ,Elizabeth and Jennifer, While it has been many years since I have seen you I have wonderful memories of Aunt Nan. Remembering my Edward relatives and sending you my sympathy on Aunt Nan’s death. Thinking of you as you mourn the loss of your Mom. Hoping all your many wonderful memories will ease the pain. Deepest sympathy . Elizabeth, Bob, and all the family. Our most sincere condolences on the loss of your darling Mother. Our thoughts and prayers are with you now. Very sorrow to hear of Nan’s passing. She was a beautiful person. My thoughts and prayers are with you all.. So sorry to hear of Nan’s passing. Our thoughts and prayers are with you at this difficult time. So sorry to hear of your mom’s passing. Condolences to all. So sorry to hear of Nan’s passing. Deepest condolences to the whole family. So sorry to hear of Aunty Nan’s passing. May the love of family and friends help you as you grieve her loss. Thinking of you all. I was so very sorry to hear of Nan’s passing. As far back as I can remember, I have many treasured memories of your Mom and Dad as part of the CLB family. Thinking of you, Dave, Bob and all the family at this difficult time. We are so sorry for the loss of your mother. May your memories and the love of your family and friends bring you peace and comfort during this difficult time. Our thoughts and prayers are with you. We are very sorry to hear at morning service yesterday at St. Thomas’ of Nan’s passing! We extend our deepest sympathy. Be assured that our thoughts and our prayers are with you in this your time of bereavement.